Find a comfortable home-away-from-home at one of these excellent Quebec City bed and breakfasts. Each has been chosen because of their great hospitality, their unique decor, clean and cozy rooms and–of course–their delicious breakfasts! Feel at home when visiting Quebec City at one of these B&B’s. 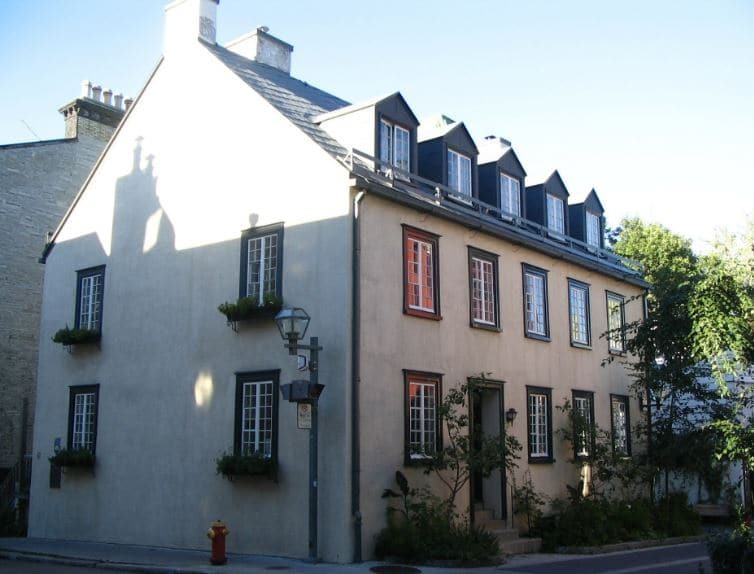 If you’re looking for a B&B in the heart of Old Quebec, Maison Historique James Thompson is situated near the historic Fortifications of Quebec. This B&B is set in a house that was built in 1793 and the interior features a classic decor with many antiques in the lounge and the rooms. The atmosphere is cozy and inviting while still being elegant. Enjoy their delicious breakfast in the dining room where guests can choose from eggs, pancakes and French toast. It’s a great B&B for families because of the multiple beds in the rooms, and the location guarantees plenty of sights to see! A 15-20 minute drive from Quebec City’s Old town, this B&B is situated on the Saint-Charles river where guests have the opportunity to rent kayaks in the summer months. The large home is beautifully decorated with the art of the hosts’ daughter who creates colourful pieces. Choose from over a dozen tasty and beautifully-presented breakfast options and enjoy it on their sunny terrace facing the river. Surrounded by woods and river, Au gîte du Hu-art is sure to have you relaxed in no time. Much like staying at a great hotel while on vacation, trying a city’s food can make your travelling experience all the better. The Old Quebec City Food Tour offers participants an opportunity to taste the culinary heritage of Old Quebec. Through a series of 12 different and delicious tastings, you’ll get to experience Quebec’s food, from modern to traditional cuisine. In addition to a hearty lunch, your local tour guide walks you through the cobblestone streets and relays the history of the area and stories behind the historic landmarks. Each stop is unique, whether you’re tickling your tastebuds or enjoying the fascinating history behind the creation of Quebec City’s old town. For more information, click here. Hailing back to 1839, Auberge L’ile Flottante has been beautifully restored while still keeping its old world feel. The inn overlooks the Saint Lawrence river and is located in the heart of the Saint-Lawrence village on the Island of Orleans. The beautifully-decorated five bedrooms each have a private bathroom and are bright, warm and comfortable. There’s also the option to rent a cottage that comes with its own kitchen, bedrooms and living room. Their breakfasts are made with fresh, local ingredients and change seasonally depending on the availability of the produce. Enjoy the Saint Lawrence river while sipping a coffee on their terrace in the warmer months, and discover all the activities the Island of Orleans has to offer. Live like royalty on your vacation at Le Château du Faubourg. Located on the cusp of Old Quebec, this restored Château’s style is inspired by Napoleon III renaissance revival architecture. Think long velvety curtains, chandeliers, grand arches, and beautiful antiques. The rooms feature beautiful antique furniture and high quality mattresses. Each room is unique: choose to stay in the library, a cozy attic or a spacious, high-ceiling bedroom. A hearty continental breakfast is offered and there’s also the option for treatments like massages, pedicures, haircuts, ect. Experience what it’s like to live in a small castle during your vacation at Le Château du Faubourg. Located within the walls of Old Quebec on a quiet street, Le Coureur des Bois is a townhouse B&B with a rustic interior. Exposed brick and stone walls give the dining room and some guest rooms a warm atmosphere. Each has its own unique decorations and is equipped with a private bathroom. The hosts are extremely friendly and accommodating, they offer a breakfast of either a savoury meal or a sweet meal like pancakes or waffles with fruit. In the warmer months, this B&B has a lovely terrace with a hammock to relax on. Enjoy your breakfast outdoors or in their charming dining room at Le Coureur des Bois. Just steps away from the stunning Château Frontenac, La Marquise de Bassano is set in a quaint stone house with a classic European decor on the inside. The B&B is cozy with its wood arches and beautiful bannister that accompanies the staircase. Each room is unique, one featuring its own tiny terrace, perfect for a morning coffee or evening cocktail. Wake up to the scent of fresh croissants and chocolatines, often baked in La Marquise’s own oven. The breakfast spread also includes a variety of cold cuts, cheese, yogurt, eggs, and fruit. The hosts are extremely friendly, making your stay even more enjoyable at La Marquise. Situated just off Saint-Jean street in the neighborhood of Saint-Jean-Baptiste, this B&B is close to the Plains of Abraham and walking distance to Quebec’s Old City. This rustic old home is inviting and comforting with its country-style decor and colourful rooms. Each room features a freestanding tub for a relaxing bath and has warm wooden furniture. Start off your day with their tasty breakfast complete with pancakes, smoothies and baked goods. Close to cafes, shopping and restaurants, this charming B&B is sure to please! This Country-style B&B, located in the heart of Old Quebec and the Old Port, offers guests comfortable, homey rooms that are clean and simple. In keeping with the country-style decor, the hosts are extremely gracious and welcoming. They prepare breakfasts with an array of fruit and tasty baked goods. Each room comes with handmade soaps, made by one of the hosts, and an ensuite bathroom. In the summer, be sure to check out the nearby farmer’s market! Au Bois Joli, located just outside of Quebec City in Bergerville, is a quaint inn with elegant, spacious rooms. Head downstairs for your morning coffee and enjoy their complimentary newspaper in their bright dining room. The hearty breakfast includes fresh fruit, tourtiere, a seasonal specialty, omelets, pancakes, homemade maple syrup that they make on sight, and much more! The B&B is in a relaxing residential area but is a bus ride or short car ride away from the bustling Quebec City. This 1900s villa, slightly outside the Old Quebec city walls, is a short walking distance from all of Quebec City’s major attractions. The decor is comfortable and kitschy, with antiques occupying many of the rooms. The breakfast consists of fresh fruit, yogurt with granola, French toast, and other delicious options. The suite room has a private living room and balcony for those looking for a spacious, more luxurious stay. All bathrooms are sleek and renovated, and the bedrooms are spotless. Castel d”Amerique Francaise is set in an old townhouse-style ancestral manor in the historic Old Quebec. Each room is uniquely decorated with an elegant, old fashion design, some featuring canopy beds, exposed wood beam ceilings and red brick walls. The large rooms and high ceilings give this B&B an airy, light atmosphere. Enjoy their hot breakfast in their formal dining room or outside on their lovely terrace in the warmer months. Having once been the home of the sixteenth bishop and third archbishop of Quebec, experience traditional luxury like never before at this elegant B&B. This Victorian-style B&B was built in 1805 and is home to the oldest grocery store in North America on its ground floor. Having opened in 1871, the grocery store is still in operation and you can visit it during your stay at this B&B. Enjoy a hot tea in their sitting room that’s decorated with functional antiques, and see the beautiful detail in the traditional architecture. The breakfast includes 3 separate courses and many meals to choose from. The rooms are on the small side, but the 19th century ambiance is something to experience. This B&B is beautifully restored and welcomes guests into its cozy, homey atmosphere. It’s situated right at the tip of the Cap Diamant, giving guests a view of the Saint-Lawrence river. Country-style furniture and decorations make up the rooms, and many of the walls feature exposed stone. Expect excellent service from the host and a gourmet breakfast in the morning!